Your husband is minding the kids and you return home to utter chaos with not one chore in sight done. Sound familiar? Yes it’s frustrating and annoying, but turns out there’s actually a scientific reason for it – men really can’t multitask. 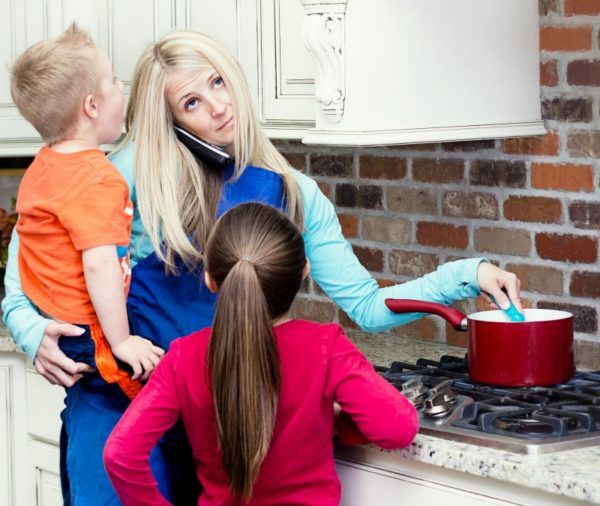 Most mothers are pros at multitasking – really because we have to be. We wipe bums and noses, prepare endless snacks, kiss scraped knees and everything else to make sure our children are tended to, happy and safe; all while cooking a lasagne, putting load (after load) of washing on, unpacking the dishwasher, cleaning the bathroom, buying groceries, paying bills and more. We’re like Hindu deities with multiple arms, because running a household when you have small children requires a massive effort. And some of us even have other jobs or work to do as well! We’re not asking for medals, we generally just get on with it. But when your husband or partner is holding the fort for a bit instead, and literally does nothing other than make sure the kids are still alive when you get back – it’s pretty annoying. Sure we’re grateful that we were able to duck out for a girls’ lunch or do a spot of shopping, but didn’t they see the clean laundry needing to be hung out? Couldn’t they have put that cup in the dishwasher or wiped up that yoghurt off the floor? We do it, so why can’t they?! Um honey, are you going to be long?? Turns out, men really can’t do more than one thing at a time (or at least are terrible at it compared to women). Us gals have of course pretty much known this for a while, but a recent study has actually now proven it’s a scientific fact – our brains work differently. The study published in the Royal Society Open Science Journal, was completed by neuroscientists from Switzerland and involved men and women walking on a treadmill while swinging their right arm and answering a brain teaser. All the men (and interestingly women over 60), found their walking and arm swing slowed down or was thrown completely off when they began to tackle the language test. All the other women however, were able to maintain their physical movements while working out the verbal task. They were completely unfazed – way to go chicks! Apparently language function and right arm swing are thought to be controlled primarily by the brain’s left hemisphere. This new study found that the complicated brain teaser overwhelmed the left brain of all the men and older women, which then affected their arm movement – something which scientists are saying gives more evidence to the theory that men aren’t actually capable of multitasking. Aha! So that’s why it’s too much for them to look after the kids AND do housework. I for one feel it’s absolutely true. So many times I’ve been talking to my husband while he’s typing a text, only for him to stop me and ask that he finish writing first because he can only concentrate on one thing. It’s taken me a while to understand this, but I’ve come to accept that it’s better I wait than risk him missing something important I am telling him that his brain won’t pick up when he’s doing something else. Where does this leave us women? Okay, so men can’t multitask, great. But are we supposed to just pick up all the slack and let the guys get away with doing less around the place? While this might work for some, I think it’s pretty unacceptable. Even men are now starting to realise themselves that ‘helping’ their wives with household chores is not quite right – they’re just everyday routine tasks that need to be done, and aren’t necessarily the job of the woman. a) Get a system going – split up the household tasks so you each know what is your responsibility (e.g. in my house I do laundry and he does bins and recycling). We are already good at multitasking and have found a system that allows us to get so much done, so help a guy out! Get one going for him as well so all their chores become second nature. b) Be specific – men are hopeless mind readers, they have very little intuition. So if you really want that washing hung out when it finishes its cycle, tell them before you head out instead of expecting them to just know it. c) Let it go – so what if the house is a mess when you get back from getting your hair done? The kids have probably had the time of their life with Dad in control and that’s important too. Plus you also got some me-time! The mess can wait until tomorrow, when you can BOTH tackle it together. Are you better at multitasking than your male partner?